a secure site by HMP Communications. The Chronic Wound Care book series is generally considered the gold standard for wound care textbooks. Over the past 25 years, each new edition has brought you the latest clinical information and research from a who’s who of wound care thought-leaders. Chronic Wound Care: The Essentials (CWCE) launched in April 2014 at SAWC Spring. We’ve compiled the essential chapters from the Chronic Wound Care book series in an easy to use and access format. 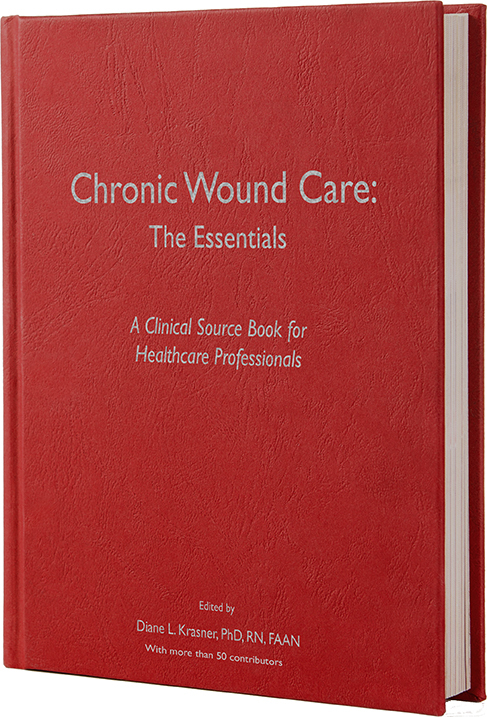 This book should be on every clinician’s shelf as it provides readers with the fundamentals of chronic wound care in one resource. The 25 chapters in Chronic Wound Care: The Essentials were selected and edited by Dr. Diane Krasner. We hope you’ll read and reference Chronic Wound Care: The Essentials when wound related clinical questions arise. We also encourage you to recommend CWCE to your wound care colleagues or clinicians just entering this field! Dr. Diane L. Krasner is a board certified wound specialist with experience in wound, ostomy & incontinence care across the continuum of care. She is a Fellow of the American Academy of Nursing and a Master of the American Professional Wound Care Association. Dr. Krasner is a wound & skin care consultant and part-time nursing instructor in York, PA. She is a volunteer at the York County Area Agency on Aging.